Sikhism is the youngest of the religions that originated in India. Barely five hundred years old, this religion developed as a consequence of upheavals in the existing religious practices, as well as from clashes between the indigenous Hindus and the invading Muslims from Afghanistan and the Middle East. A similar disenchantment with the Hindus’ caste system and the consequent inequalities gave birth to two other religions in India (Buddhism and Jainism), almost two thousand years before the rise of Sikhism. Of these, Buddhism spread to all parts of Asia, especially the East and Southeast, but the ascetic Jainism was confined to India. While the adherents of Sikhism have traveled far and wide and settled in many countries, the most numerous are still in India. Proportionately smaller numbers remain in West Punjab, which became a part of Pakistan at the time of Independence. The founder of Sikhism, Guru Nanak, was born in 1469 AD, as the second child of Mehta Kalian Das and his wife, Mata Tripta. The birthplace, the village of Talwandi, was situated close to Lahore, now Nanakana, in Pakistan. His father was a god-fearing man of modest means, well-respected in the village. Nanak Rai possessed a keen intellect, a gentle disposition, and from early life he demonstrated an aversion for blind belief in any superstitious religious practices. Above all, while maintaining his gentle nature, he questioned the purpose of rituals and asceticism. One day he is said to have emerged from his daily bath in the river Bain, virtually transformed into Guru Nanak. He reported having been in the presence of the Almighty and given the task of becoming his apostle. One of his first pronouncements was that ‘there is no Hindu, there is no Mussalman;” in essence that in the eyes of God all humans were equal. He left his home and, along with two disciples, a Muslim called Mardana and a Hindu, Bala, he traveled across India. He preached his message of universal love and equality of all humans. He used poetry in the local dialect (as opposed to the esoteric Sanskrit used by Hindu priests) to teach his disciples. Later, the devotional hymns would become the basis of the “Adi Granth”, the Sikhs’ early scripture. After he completed his travels, he and his disciples set up a township and called it “Kartarpur” (Abode of God). He, his family and several disciples set up farming there and thus started the concept of communal living, a sharing of the chores, food and other commodities by all. Although he was inevitably becoming an idol himself, he preferred to be regarded as an instrument, a servant of God. Thus, the foundation was laid for a religion based on deep devotion to an Almighty God, a caste-less society and work ethics which included shared work in all communal activities. Guru Nanak shunned festivals and rituals and any sort of ascetic practices and celibacy. The twin precepts, “Sangat” (organization) and “Shabad gurbani” (Guru’s words) and the trio of “kirt karo” (work), Wand Chakkho (sharing the fruits of your labor with the poor and the needy) and “naam japo” (chant His name) formed the basis of Sikhism. In order to avoid societal hierarchy, Guru Nanak introduced the concept of community kitchens, the so-called “Langar”. The idea was preparation and sharing of meals in these kitchens before praying in the morning and evening. The importance of leading a family life and sharing the fruits of such life with the community extended to the Guru’s choice of the person for succession after his death. He did not believe in blind succession based on family hierarchy. Thus, he chose his dear disciple Lehna as his successor, rather than his own two sons. His decision was also influenced by the fact that one of his two sons, Sri Chand had renounced material wealth and lived the life of an ascetic. Lastly, Guru Nanak laid the foundation for what can be called the scripture of Sikhism, Sri Guru Granth Sahib. Its foundation was formed by 974 hymns he had composed. However, its text was enriched by the writings of many scholars and future Gurus; some of the scholars were not even of Sikh faith. In all there were ten gurus, including Guru Nanak. The second guru was the closest disciple of the former, Lehna who was renamed Angad. After the succession, Guru Angad moved from Kartarpur to the village of Khadur. 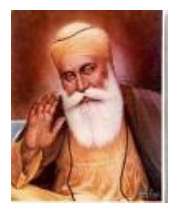 He faithfully continued the community living pioneered by Guru Nanak. Another accomplishment of his was the writing of the biography of Guru Nanak, which he called “Janam Sakhi”. He also made many refinements to the “Gurmukhi Script” (“from the guru’s lips), by standardizing the script in great detail in its alphabet, grammar, phonetics and the pronunciation. Thus developed, he used this script to rewrite the Guru Granth Sahib. He also added sixty two shlokas to the Granth Sahib. By the time he died in 1552, after being at the helm for 12 years, he had further developed Sikhism as a cohesive community-oriented religion. He also selected a devoted disciple, rather than one his off springs to become the next guru. Guru Amar Das became the leader at the advanced age of 73 and remained the supreme leader of the Sikh faith until his demise 22 years later, at the age of 95. His greatest contributions were strengthening “sangat” (gathering of the community), “pangat” (eating together from the same kitchen and “langar” (free community kitchen). These measures, as well as the equal treatment of women distinguished Sikhism, and these aspects of the budding religion were greatly admired by Emperor Akbar. The next guru, Ram Das was also hand-picked by his predecessor. He was married to the Guru’s daughter and served as the supreme spiritual leader of Sikhism for only 7 years. However, he founded the city of Amritsar, and through the services of “Ambassadors” (the ‘massand’ system) he aspired to spread Sikhism beyond the Punjab. The digging of the tank at Amritsar was also his achievement. Further refinements in the Sikh faith made by Guru Ram Das included eradicating superstitions. Contrary to his predecessors’ practice, he selected his youngest son Arjan Dev as the next guru of the Sikhs. adding to them some of his own, as well as the writings of many contemporary men of faith in other religions, he compiled the “Granth Sahib” which has since come to be regarded as the holy scripture of Sikhism. This treatise was finally accorded the state of guru by the tenth guru, Guru Govind Singh and has since been called “Guru Granth Sahib”. Sikhism’s development into a faith of “soldier saint,” was during and immediately after Guru Arjan Dev’s time. Akbar’s son, Jehangir, was less tolerant of Sikhism, and under the mistaken belief that the Granth Sahib had derogatory references to the Quran, the Emperor summoned the Guru to Delhi. He asked the Guru to remove the offending passages from the Granth Sahib and fined him heavily. When Guru Dev refused, he was tortured and killed. This was the turning point in the essentially peaceful religion of Sikhism, whose faithful took up arms and became a well- disciplined force that would from then on excel in all the military branches. The combining of Bhakti (spirituality) and of Shakti (power) led to the concept of the soldier-saint. These developments were given religious sanction by the next guru, Guru Hargobind. Hargobind was the eleven year old son of Guru Arjan Dev, and the faithful rallied behind him soon after his father’s death. Guru Hargobind did manage to forge a friendly relationship with Emperor Jehangir. However, the latter’s son, Shah Jahan’s, policies further alienated the Sikhs. Their forces had several armed conflicts with the Emperor’s forces and many victories. The next Guru, Har Rai, was the grandson of Guru Hargobind, who, ordained Har Rai before his peaceful death following thirty-eight years of leadership. The relative peace with the Mughals would evaporate after the ascension of Aurangzeb as the Emperor. Guru Har Rai died unexpectedly, although he had already named his younger son, Harkishen, as the 8th guru. The five year old Harkishen died after being at the helm for only 4 years. Before he died from smallpox he named his grand-uncle, Tegh Bahadur, as his successor. Guru Tegh Bahadur traveled extensively in India, preaching the tenets of Sikhism. However, his support for some Kashmir Brahmins, who were persecuted by Aurangzeb’s men, earned the displeasure of the Emperor. The guru was summoned to Delhi, and without a proper trial he was killed by beheading. On suspicion that he might never return, he had already appointed his son, Gobind Rai, as the new spiritual leader. Guru Gobind Singh was the tenth and last guru. He was a great scholar as well as a person well-versed in hunting, sports and the military techniques. Thus, under his reign the concept of Soldier-Saint solidified. Although he resorted to force only as a last resort, he inculcated in the faithful the importance of being able to defend themselves from injustice. Legend has it that one day while addressing a gathering he asked for five young Sikhs who were willing to be sacrificed. He thus took one by one the young men and came back with a sword dripping in blood. After the fifth one, he came back with all five alive and well; he had sacrificed a goat instead of the young Sikhs each time. He then blessed the five young men as the “Pan pyaras” (“his beloved five”). He baptized them and the word Singh (lion) was added as prefix to each of these men. These “sant-sipahis” (soldier-saints) were required to carry the “panch kakkar”or the five Ks (kesh= unshorn hair, both scalp and beard, kascha (pair of shorts), kirpan = dagger, kara= a steel bangle and kangha = a comb on their persons at all times. And they were required to uphold justice and righteousness. At the end of his reign as the supreme leader he handed over stewardship of the community to the Holy Granth (instead of any new guru). Thus he was the tenth and the last guru of Sikhism. 1. Kesh: Sikh men are forbidden from trimming their facial or scalp hair. This tradition started with the first guru, Guru Nanak. Thus originated, the familiar look of the turbaned Sikh men with full beard. 2. Kangha: A comb is always carried on the unshorn hair; it is worn by Sikhs under the turban. 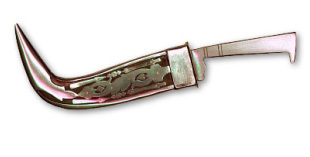 3) Kirban: This is a curved knife Sikhs are required to carry on their torsos. It is hung from over their shoulders. The dagger is symbolic of courage and self-reliance. 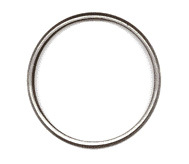 4..Kara: This is a steel bracelet worn on the right wrist. It is thought to be a sign of pruity and acts as a constant reminder of doing good deeds with one's hands. 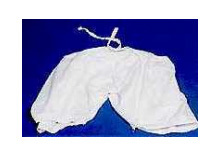 5.Kachera: These are thin cotton shorts worn by men as an undergarment. 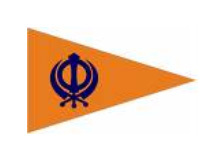 In addition to the above, two symbolic items are also worn by Sikh men. Khanda comprises of two curved swords around two swords. 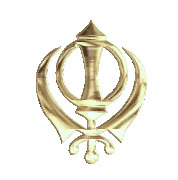 These are emblems worn outside the turban. “Nishan Sahib” is made of a tall steel flag-pole that ends with a two-edged dagger (khanda) on top; this is mounted on a platform. Usually a yellow triangular flag flutters above this symbol. “Amrit Sanskar,” or baptism, is the rite of initiation of an individual (without regard to caste or gender) into the faith. Thus baptized, men add the suffix “Singh” to their name and women add the word “Kaur”. Baptised individuals are barred from using tobacco, cutting their hair or beard, extra-marital affairs and eating ‘halal’ meats. The process of baptism takes place in a quiet location, in the presence of the “Guru Granth Sahib”. Unlike the other religions, Sikhism does not require a specialist priest or priests to perform the ritual. There are six Sikhs (of either gender) present at the ceremony. One is in charge of the Guru Granth Sahib; the others carry out the baptism. First the “amrit” (holy nectar) is made by mixing sugar in clean water. It is stirred using a steel ‘kirpan’ (dagger). The symbolism in mixing sugar with the dagger is of a fusion of compassion and valor. During the preparation of the amrit, hymns from the ‘Japja Sahib’, the ten Sawaiyas, Bainti Chaupi and six verses from the Anand Sahib are chanted. The five “beloved ones” sit around the amrit in the “bir” posture, which is right leg folded under the body while the left leg is kept upright up to the shin (warrior’s position’). Then the five beloved ones offer the amrit to the initiate; he or she drinks it form the right hand cupped above the left and drinks it five times. The person pouring the amrit chants “Wahe Guruji da Kalsa, Wahe Guruji di Fateh” loudly, each time the nectar is poured into the initiate’s palms. The latter repeats the chant each time after swallowing the nectar. Any of the amrit left over is shared by all the people being baptized, from the same bowl. The five beloved ones recite the ‘mul mantra’ (the seminal chant), and all the baptized individuals repeat them. During this process, the baptized persons are reminded of their role and moral conduct as a “Kalsa”. Transgressions are punished according to their severity but usually are pardoned, upon the Sikh’s admission. However, transgressions involving disrespect to the Guru Granth Sahib or the five ”Ks” are serious and may end in excommunication from the Khalsa brotherhood. Sikhism does not promote a caste system or asceticism. It is firmly rooted in service to humanity and living an honest living and leading a normal family life. It also encourages sharing the fruits of hard labor. “When an affair is past every other remedy, It is righteous, indeed, to unsheathe the sword”. This is your chance to meet God. Your other pursuits will be of no avail at the end. Seek the company of holy men, and learn to meditate on God. Life is being wasted away in pursuits of sensual pleasures”. In order to attain God, Sikhs are required to rise above five basic vices: lust, anger, greed, pride and ego. If one can avoid these vices, one is considered to live a truthful living and that person is thought to be God-conscious. 1. Meditation (Nam Japna): All Sikhs must recite or listen to God’s praises and offer prayers. 2) Truthful living (Kirt Karna): All must lead a truthful life. The actions must be true and noble. 3. Sharing (Wand ke chheako): All must share wealth, knowledge and services with others who are less fortunate. All Sikhs must give 1/10 of his or her disposable income to charity. Do not take alcohol, tobacco or drugs. Do not eat halal meat. Do not eat any food which inflames passions. Do not commit theft or gamble. This means that good actions of a person have good results and bad actions have bad effects. This is the law of karma. All persons live a series of lives and the kind of life one lives in this life is determined by good or bad actions in the previous life or lives. In this respect Sikhism is identical to Hinduism. The soul is considered to be immortal and the body just a vessel for transporting the soul. After numerous incarnations, the soul eventually merges with God, if the karma is satisfied through repeated lives and sufferings. This is the state of Mukti. 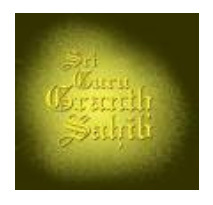 The most important Sikh Scripture is, of course, Sri Guru Granth Sahib. It was started by Guru Nanak and originally called Adi Granth. The present version was compiled by Guru Gobind Singh, the fifth Guru, and contain contributions of all the Sikh gurus, as well as many persons of faith from other religions; this is considered the living Guru for all Sikhs. 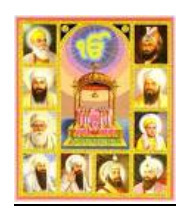 The second most important Scripture of the Sikhs is called “Dasam Granth.” This is the book of the tenth Guru; it was compiled three years after the death of the Guru.